I’ve heard and admired quite a number of Craig Sheppard’s previous discs issued by Roméo Records. In common with his usual practice, this recording, like its predecessors, comes from live performances in the Meany Theater, Seattle. There’s one quite significant difference, though. To the best of my recollection, all the Sheppard recordings that I’ve heard, including two featuring the music of J S Bach (review ~ review) have been played on Steinway pianos, either his own instrument or the Meany Theater’s piano. This time, however, Sheppard has opted to use a Yamaha. I wonder why the change was made? Perhaps he felt that the bright Yamaha sound would bring even greater clarity to the contrapuntal lines than would be possible on a Steinway, or perhaps the Yamaha action better suits this music. It matters not; the results are still eminently satisfactory. Sheppard’s performing order for The Art of Fugue has Contrapuncti 1 -13, followed by the four Canons. He finishes with the grandest piece of all, Contrapunctus 14. That piece was apparently left unfinished by Bach – though the eminent Bach scholar, Christian Wolff has propounded the theory that the piece was finished but that the ending, on a separate piece of manuscript paper, was lost. There have been a number of attempted completions down the years and Craig Sheppard has chosen to play the version by Professor Kevin Korsyn. It’s not entirely certain what led Bach to compose The Art of Fugue. Was it simply to demonstrate his mastery in fugal writing? Did he ever intend that all the pieces should be performed together or did he expect them to be used as Studies? Nor is it certain whether Bach intended the music to be performed on a specific instrument. It might well seem a daunting prospect to sit down and listen to over 75 minutes of fugal writing. However, the modern piano offers ample variety of tonal resources and in the hands of the right pianist the writing need not sound daunting. It certainly doesn’t sound daunting on this occasion because Sheppard brings great imagination and pianistic skill to the music and he always makes it interesting; there’s never any risk of Bach’s writing seeming dry or academic. So, for example, Contrapunctus 12 in both its rectus and inversus forms, benefits from what I’ve noted down as a feline staccato, especially in the bass line. The rectus presentation of Contrapunctus 13 is a marry jig, played with fine rhythmic energy and crisp articulation. Those virtues also inform not only the performance of the inversus version of that fugue but also spill over into the following Canon in Hypodiapason, which is played with terrific vitality. I referred a moment ago to Sheppard’s feline staccato. There’s an earlier example of that in Contrapunctus 3 where I’ve scribbled in my notes (with apologies to Gilbert and Sullivan) “with cat-like tread”. Craig Sheppard provides his own excellent notes on the music and in these he describes Contrapunctus 2 as “jaunty and a bit jazzy”; that view is echoed in his delivery of the music, though I should hasten to say that there’s no unwarranted gimmickry. I love the mixture of grandeur and athleticism that he brings to the French-Overture style of Contrapunctus 6. Clarity is the hallmark of Sheppard’s way with these pieces. Nowhere is this more apparent than midway through the cycle. He describes the writing in Contrapunctus 8 as “light-hearted banter” and most certainly the music doesn’t lie heavily under Sheppard’s fingers. This piece is a bravura display of writing by Bach and Sheppard brings it entertainingly to life. Contrapunctus 9 is, if anything, an even more dazzling affair, both compositionally and, here, pianistically. Craig Sheppard’s articulation of the music is splendid. Contrapunctus 11 is a triple fugue and what I might describe as the complexities of Bach’s plot are worthy of a Poirot mystery. Craig Sheppard navigates his way through the complexities surely and draws the listener along with him. Contrapunctus 14 is the longest of the pieces. Bach’s surviving manuscript stops at bar 239. I must say that Kevin Korsyn’s completion seemed entirely successful and idiomatic to me. 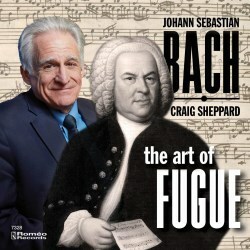 I admire the way Craig Sheppard plays the stately opening pages and then, when the music assumes a livelier character with the introduction of the second fugue, Bach’s writing is precise and logical and Sheppard unfolds it with seeming inevitability. There isn’t a dull moment in this traversal of The Art of Fugue. Craig Sheppard plays with flair, invention and an evident deep understanding of the music. That latter quality is also evident in his notes which offer an excellent guide to the music. The recording itself is very good and you won’t hear a sound out of the Seattle audience.